“The Appalachian Way in Coal Country” from Christian Faith Publishing author Lois Walker West is a personal family history written and illustrated by the youngest daughter of a large and loving Kentucky family making their way in a remote coal-mining town in the forties and fifties. “The Appalachian Way in Coal Country”: a memoir of a midcentury East Kentucky childhood. “The Appalachian Way in Coal Country” is the creation of published author Lois Walker West, a Kentucky native who spent most of her adult life in Ohio before moving to Florida in retirement, where she enjoys writing and illustrating children’s stories for her three great-grandchildren and trips to the beach with her sisters. Living in a home with no electricity, no indoor plumbing, and an outhouse for a bathroom is a few of the true inconveniences experienced by the author as a child. Her parents had lived in Kentucky long before she was born. Her ancestors found their way into the Kentucky mountains from Scotland and Ireland by way of England in search of a better life. The search ended when they reached the southeastern Kentucky mountains. Land in that area was most likely available through land grants. In the early 1930s, the father inherited a parcel of the land that was once owned by the great-grandfather. These twenty acres or more provided the family a way to survive in this remote area. The natural wooded area changed drastically when coal was found in that area of Kentucky. A large part of the grandfather’s land was leased to a coal mining company. The development of coal mining communities covered many acres of the land. This was when Allais, Kentucky, was added to the map. After many years of working underground in a coal mine, the father was diagnosed with a form of leukemia in the late 1940s. He was blessed with relatives and friends in Allais when they donated the blood he needed to live. He prayed to God to keep him alive until all his children were on their own. God chose to take him in a car accident the day his last child was getting her marriage license. The author’s memories of her happy childhood are true experiences, and her love of Kentucky will remain and be passed on to all her present and future generations. Published by Christian Faith Publishing, Lois Walker West’s new book is a nostalgic look at a fading portrait of American rural life. View a synopsis of “The Appalachian Way in Coal Country” on YouTube. 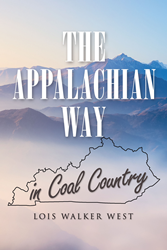 Readers can purchase “The Appalachian Way in Coal Country” at traditional brick and mortar bookstores, or online at Amazon.com, Apple iTunes store, or Barnes and Noble. For additional information or inquiries about “The Appalachian Way in Coal Country”, contact the Christian Faith Publishing media department at 866-554-0919.